Curry Cuisine brings you a unique way to learn and cook Indian food. With over 10 years experience in teaching cookery school founder and tutor, Prett aims to move curry and Indian food lovers away from uninspiring takeaways and jar based recipes by giving them the confidence to cook more adventurous and authentic Indian cuisine from scratch at home. Prett hopes her easy family recipes will inject enthusiasm to explore new tastes and spice combinations, from day to day cooking, to the celebration dishes you’ll never find outside the Indian home, and even some of the authentic street food of Mumbai. Each course revolves around preparing a complete Indian meal. Step by step we’ll unlock the secrets of combining the aromatic spices at the heart of each dish. It’s all hands on with the reward of a fantastic meal for 2 or more for an additional charge. Whether you're a complete beginner keen to learn the basics, a home cook looking for a 'hands on' challenge, or you simply want to sit back and watch an inspirational cookery demonstration (and taste the delicious results! 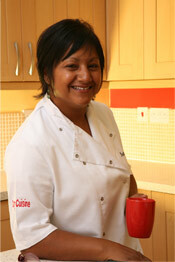 ), the Curry Cuisine Cookery School has the perfect course for you. Our courses showcase deliciously diverse and simple dishes inspired by much loved family recipes from Prett's book 'Family Secrets' a journey in indian cooking.